My knowledge about HIV is a bit limited however in Infectious Diseases we did cover the basics of the disease. HIV is a retrovirus that is sexually transmitted. It's origin isn't completely known, but is believed to have started somewhere in Africa. It eventually causes immune system failure leading to death from some other disease that is contracted by the host. It was initially discovered when outbreaks of another disease healthy people could fight off started killing them. It also arose during the "free love" period from the 1960's-1970's thus causing almost epidemic outbreaks due to people having many partners. Essentially, the disease causes a significant drop in CD4+ T-Cells in the host, then the host creates more in an effort to replace them causing a bit of a dormant stage, the third step is a much more drastic decrease in the CD4+ T-Cells making the host highly susceptible to other diseases. Also, one interesting fact is that there is a specific immunity to HIV, and that was discovered in Africa from women who were not contracting the disease from men known to have it. While I can't remember what the exact dificiency is off the top of my head, I do know that it has to do with something in their blood cells (maybe related to sickle-cell anemia?). This seems very interesting becuase research could be done off this to potentially discover a cure for HIV. How does HIV attack the gp120 region in the host? What is it about HIV that makes mutations within each host so high? What exactly causes the specific immunity I attempted to describe above? Have the stigmas that go along with HIV diminished over the years or are they still present among the general population? Are the stigmas different in different countries? I clicked on the top result; and an abstract appears for the article. After searching for Abergel- the screenshot from our textbook Bioinformatics for Dummies is similar except that the location of the free text buttons is not the same. Overall; after following the protocol from the Bioinformatics for Dummies book, it became clear that it is already a bit outdated. However, the overall features were still the same and with a little searching I could find the different menus and options to refine my search. The screenshots had small differences between what was shown in the book. 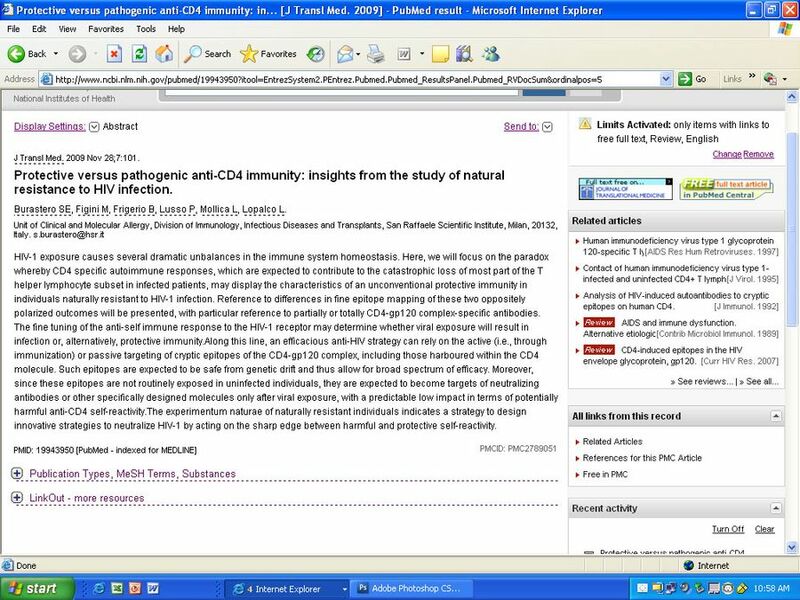 In order to choose a HIV related article on PubMed, I followed some of the general steps of the previous protocol. I set limits to show only reviews as well as only articles in English first. Then I picked out a specific article based off of my own interests. The article talks about the anti-CD4+ immunity; the natural resistance to HIV, which correlates to one of my earlier questions. My search results in comparison to PubMed seemed very different. It didn't seem that many of the same articles popped up, even though I searched the same thing on both sites. However, the google search still came up with some interesting articles. With ISI; it seemed much more in depth and organized. It also made more sense to me when I was using it. Serological:(serology) The science that deals with the properties of serums (especially of the blood). Phylogenetic: relating to the race and history of a type of organism. Mutational divergence: A change in something that leads to the moving or spreading in different directions. Monophyletic:if all organisms in that group are known to have developed from a common ancestral form, and all descendants of that form are included in the group. Non-Progressor: a person who has been infected with HIV for 7-12 years without developing a full case of AIDS. Epitopes: Part of an antigenic molecule to which the t-cell receptor responds, a site on a large molecule against which an antibody will be produced and to which it will bind. Hypervariable region/domain: The regions of the immunoglobulin molecule that contain most of the residues involved in the antibody binding site. Viral Load: The number of viral particles in a sample of blood plasma. Nested PCR:(Polymerase Chain Reaction)- a technique used to magnify and copy pieces of DNA; the nesting is used to reduce contamination. Serum: A clear liquid that seperates from blood or other bodily fluids. Mulitple studies have shown that viral DNA is obtained from infected, unactivated PBMC. Previous studies also looked at smaller groups of people. They characterized HIV-1 genetic evolution using different techniques that did not directly examine the sequence patterns. They studied the progression rates in different people. There is a specific focus placed on the high mutation and replication rates of the disease. The main result is that the different levels at which the CD4 T-cells fall during specific time periods shows distinct differences in mutations. HIV-1 has very high mutation and replication rates which allow for easy adaptation. There were three defined groups for this study: rapid progressors, moderate progressors, and nonprogressors. Rates of increase in sequence diversity at a given point was higher in progressors than nonprogressors. Viral evolution in those with rapid or moderate progression showed a favoratism for nonsynonymous mutations. For 10 of the people involved in the study no single variant predominated over the 4 year time period. The study group was conducted with 15 different people. All were participants in a program called ALIVE. Which follows both at risk and infected people with the potential to contract HIV intravenously. They were folled at six month intervals; over a total of four years. Nested PCR was used to amplify a region of the env gene on the PBMC. External primers and nested primers were used. The PCR tests were subjected to multiple temperatures and then analized. The plasma viral load was determined. Different trees were constructed using computer software called MEGA. Taxon labels were used to show the time at which strains were isolated. The taxa were then colored based on the times they were isolated at. The correlation between genetic diversity and CD4 T cells was determined a year lated based on pairs of visits. 76 time points were determine on the 15 subjects. The stratification of CD4 T- cells compares to the diversity or divergence. The strains were classified as synonymous or nonsynonymous. The dS and dN values and their ratios were averaged at a particular point. Examination of Source of Greater Initial Visit Diversity in Subjects 9 and 15. There was a high genetic variation in 9 and 15, so they wanted to see if they had been infected with two different viruses. The exclusion of subject 15 did not change the dS/ dN analysis. For each subject they fitted a regression line of divergence/ diversity over time. The CD4 T Cells declining pattern was extemely variable among the 15 subjects. The nonprogressor group had low viral loads. The third hypervariable (V3) domain located on the viral env region was analyzed due to the frequent mutations. Diversity and divergence were shown to be negatively correlated with the CD4 T cell count over the time period of a year. Results at 9 and 15 showed the possibility for dual infection or other timing issues. Further analysis excluded these possiblities for heterogeneity. Both divergence and diversity increased over time in all three groups. The increase in diversity and divergence of a subject's virus (from nonprogressive to rapid), the more likely they were to have a greater CD4 T cell decline over the next year. Higher levels of genetic diversity and divergence correlated with a greater decline in CD4 T Cells. Nonsynonymous substitution rates in progressors were three times greater than nonprogressors. Viral strains of nonprogressors showed the possibility for selection against amino acid change. Viral strains of progressors showed the possiblility for selection FOR amino acid change. McDonald's results conflicted with the results of this study in intravisit diversity. Wolinksy's study showed less diversity in subjects with rapidly declining CD4 T cell counts. A more broad effective immune response (as potentially seen in nonprogressors) might not replicate to the critical threshold required for targeting the immune response. The ulitimate goal and importance of the study was to see if there is a possibility of stopping the mutations and diversity of the HIV virus. Figure 1: The CD4 T cell trajectory, divergence and diversity over time. Table 1: Shows the subjects classified into the three main groups; it shows all of the data discovered on each person. Figure 2: Compares the slope of the different progressor groups per year based on the divergence and diversity. Figure 4: The phylogenic trees for four other subjects of the study; it shows the viral evolution and subsequent mutations. This page was last edited on 7 February 2010, at 01:44.